I never really bother to watch cable network monster movies. At times when I'm lazing around, channel surfing and they're always on, I opt for a syndicated sitcom that I easily quote lines from. This is no judgement on these films. Not all of them are terrible. And they keep thirsty film career folks employed. I'm actually glad they exist, but getting me to watch one on a leap of faith is a chore. 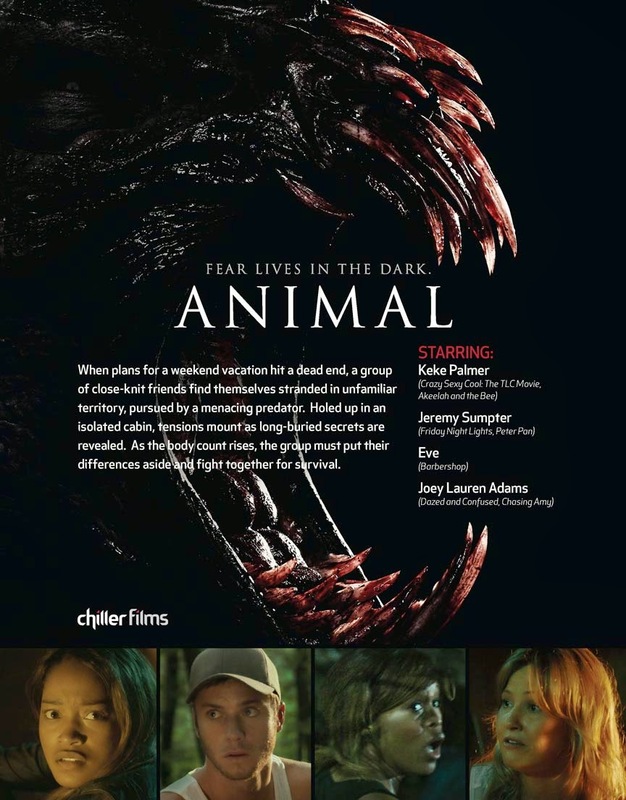 When Animal (2014) was released on VOD and in theaters June 17th, I made sure I got my second wind that evening to catch what I only speculated to be a cabin-in-the-woods-esque creature feature with two Black female leads. The uncommon casting is what piqued my interest. Actress Keke Palmer taking on the featured role as Alissa, the resourceful, confident one of the bunch is pretty cool. If I had a Black, tween girl in my pocket who liked genre film, I would watch Animal with her, imagining Palmer's portrayal would be influential, much like Toy Newkirk in a Freddy film was for me. She, along with four other teenagers take a "one with nature" trip into the woods only to be hunted by an unnatural beast hungry for human flesh. It's delightful in its use of relying on horror character tropes because it sneakily strays from caricaturization. Jeff, Mandy, Alissa, Matt, and Sean are all relatively likeable with varying, balanced traits that add to the progression of the story. Along the way, they encounter three adults who've been dodging the beasts' advances on their mortality for quite some time. As they all try to survive the night, emotional moments are exchanged, secrets are revealed, and surprises that could be not so surprising drive the story towards a rather solemn and open ended conclusion. Beautifully shot with believable dialogue, Animal is a solid watch with only disappointing aspects and red herrings that hinge more on pure subjectivity. The issue with this film at times is that it awkwardly shifts from a full-on monster fare to a darker, off-shoot of The Breakfast Club. This actually works because it's far from predictable, but can be frustrating and disengaging because you can't decide what you want more of. Animal feels like the foundation for something bigger. There are clues throughout the film that allow your imagination to run with possibilities but ends with no further exploration into the why's and how's, which is not always a bad idea. A bit more insight without over explaining would've been fine and felt more satisfying. Do not be surprised if we see a sequel. In short, Animal was about survival, both primal and emotional and the struggle to maintain both. It proposed that they are equally needed to preserve our humanity. Without, the characters were no different than what was hunting them. This film would do better to watch with a group of friends than by your lonesome. But if you have to go it alone, I'm here for your thoughts, rage, feedback, delight. Animal is certainly worth a watch and support of our sisters in horror. Keke's performance is honed in and truly refreshing. I would love to see her really break out in other genre fare in the future. Check out Animal now in select theaters and all VOD options.